I took a bicycle ride and made a map that shows how the Felstead Ave route ‘cut-through’ can connect several existing Cycle Infrastructure via On-Street Routes and Informal Connections – some of which also provide opportunities for better Quality connections. The box describes connections to existing East-West & North-South Cycling Infrastructure. The line along the top of the map is the Felstead East-West Route from the O’Connor Bridge over to Broadview Avenue. 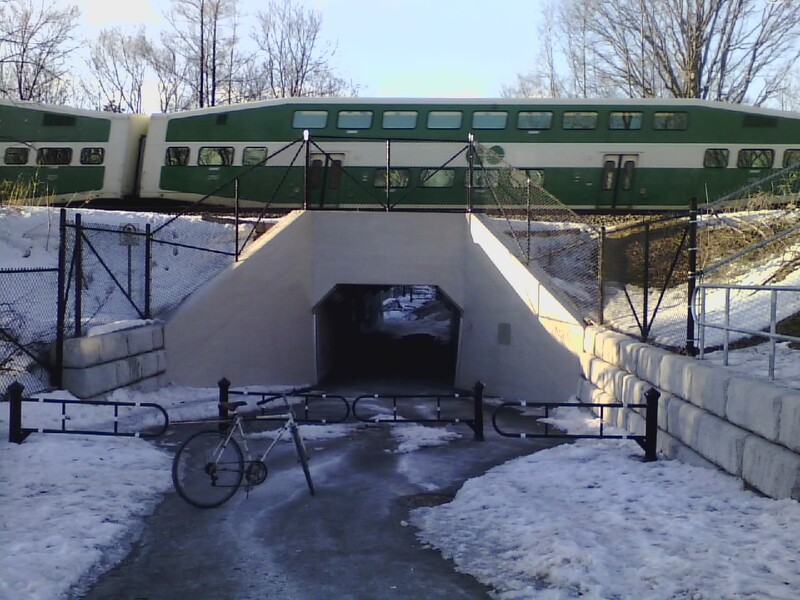 The route allows cyclists who do not wish to ride on Danforth Avenue, a route to get to the Downtown via this East West route to Broadview, from which they can access the Bloor Viaduct Bike Lanes to get to up-town destinations along Bloor Street East and West. The East-West Felstead Route also makes connections to North-South Bike Lanes on Greenwood Avenue and Jones Avenue. 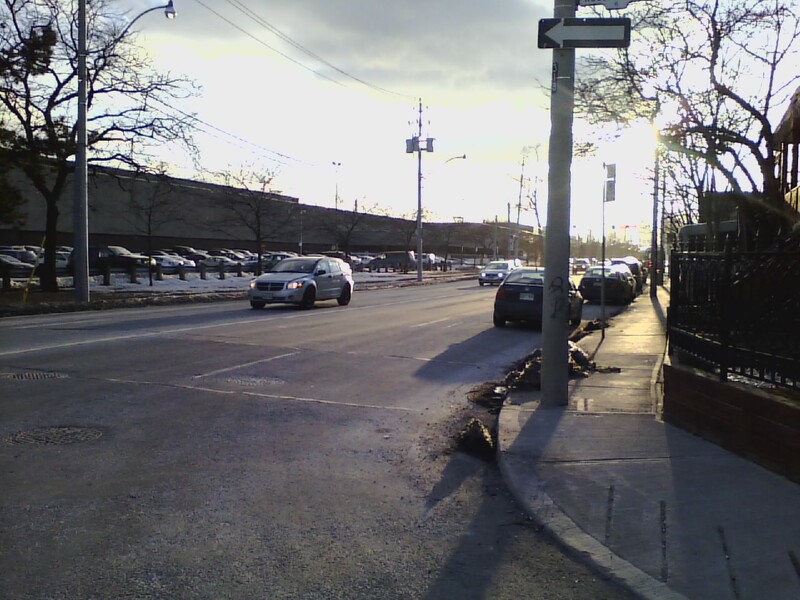 These separated lanes then connect to major East west commute routes that feed into either mid-town via Dundas Bike Lanes; or the Finacial Core and the Lake Front via the Lower Don Recreation Trail and Queens Quay Bike Lanes. The “Informal Connections” were all bare to pavement – and located where they were supposed to be. 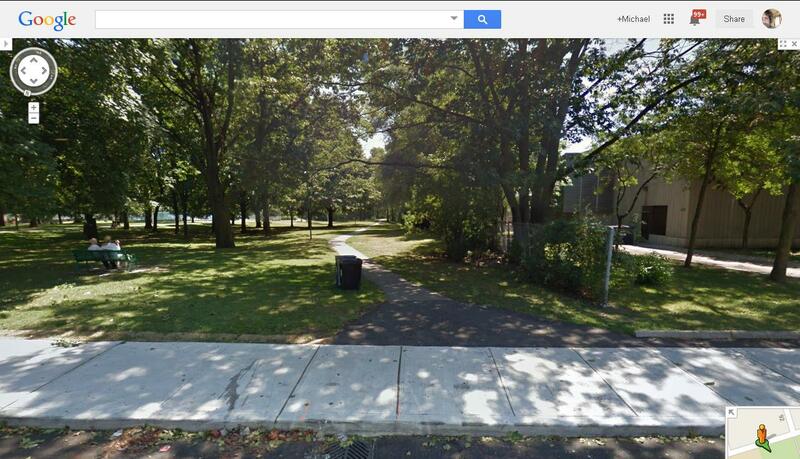 The ‘Trail’ part of the route, East out of the Parkette over to Phin and then across another Park (TTC land?) to Oakvale – are sidewalks. At the edge of Phin Avenue Parkette the sidewalk is also the front door-stoops of a row of 5, two story semi-detached homes there. 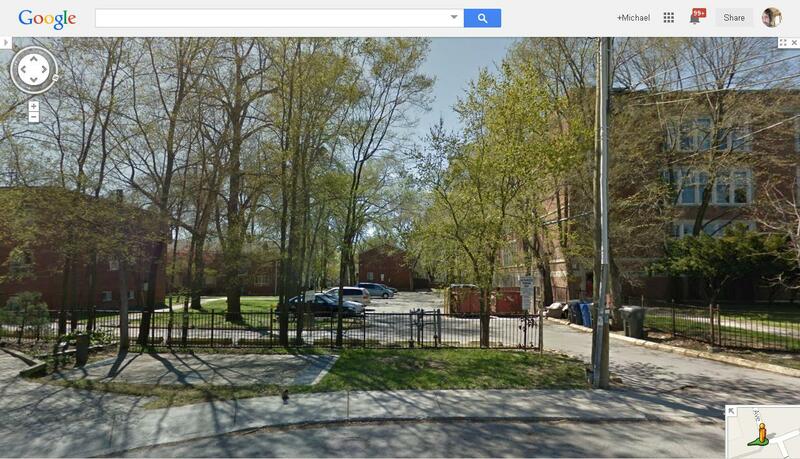 Google Street View – Phin Ave West to Phin Avenue Parkette Informal Connection – is actually a neighbourhood sidewalk. Perhaps a Multi-Use Trail around the South edge of the Parking Lot? We could think about how this route might serve the community if it were expanded into a wide, well marked Multi-Use Trail. This route undoubtedly already acts as a cycle and walking route to the school just to the North – Eastern Commerce Collegiate. Turning around and looking East from the POV in the image above, is East on Phin Ave as it curves around – to another Park area – looks like part of the TTC land there. Again a narrow sidewalk could be a Multi-Use Trail. 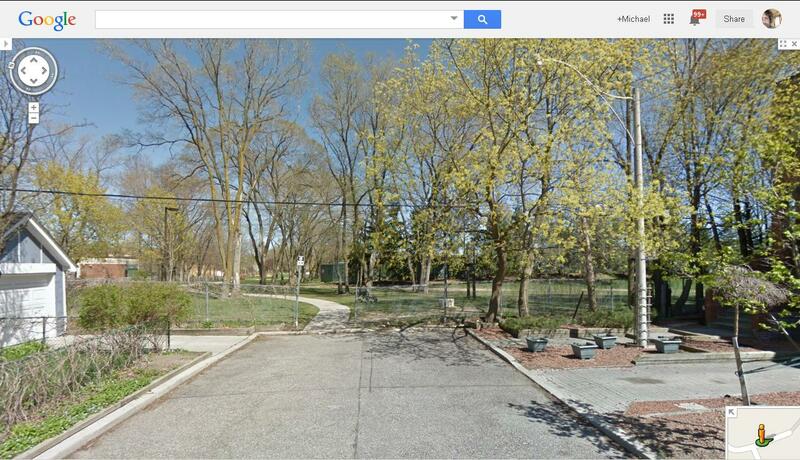 Google Street View – Phin Ave East towards Oakvale Ave. The Informal Connection is a narrow sidewalk; perhaps a Multi-Use Trail here? At Oakvale and Greenwood I turned Southbound for three blocks down to Felstead Avenue. With the speed of Greenwood there, the left turn onto Felstead from southbound Greenwood is scary even for an experienced cyclist. The Felstead/Greenwood intersection has a Crosswalk on the south side of it. We can think about how to make that safer. Although I didn’t ride the route northbound – the same is likely true at the Oakvale/Greenwood intersection. The Felstead Street Closure is currently a place used for snow storage Looks like the City Operators – and the Catholic School Operator are piling snow on it. Felstead is a favourite East-West Route of mine – I discovered it several years ago – it goes all the way from Main Street (down the Woodbine Steps & up the Woodbine Steps) and the rest – all the way to Broadview is on your seat. At Monarch Park there seems to be a Trail that people use along the Western edge of the park. It was footfalls in the snow, frozen like fossils. This image from Google Street View – taken in the summer – shows that under the winter snow is a walking path, the width of a narrow sidewalk. 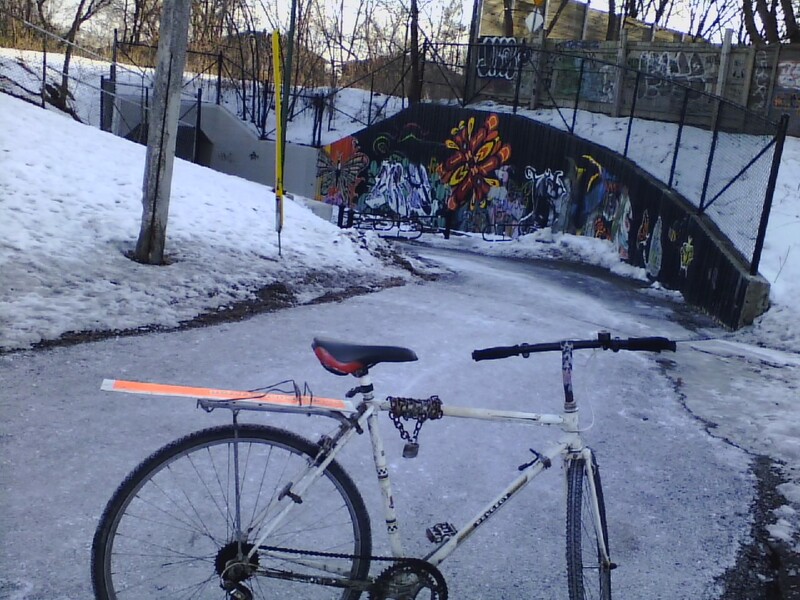 I wanted to explore the edge path but my hip told me not to risk it – falling on jagged ice is not good for cycling. So I took the North-South maintenance and policing access road through the middle of the Park (it runs south of the end of Gillard Ave). It was clear and bare to pavement all the way to the Tunnel. The Park itself is great – full of Public Amenities (a blow-up dome houses a football pitch! (told me a dad plying soccer with his son on this -12°C day) – and old tree growth; like the canopy at Kew Gardens in the Beaches. The Tunnel is a ‘deep’ place in the South-West corner of the Park – but the painting and the openness of the tunnel feel pretty good. The areas either side of the tunnel could do with benches for people to sit on. On the Woodfield side, a neighbour has actually added some up on a hill-top overlooking the dip. Needs play facilities. It’s surrounded by homes and would make a great place for a local community play destination.